‘“Isolation in a necessity, when there is no one you can trust,” Lia retorted.’ (Page 129). Lia has been a slave on General Oort’s slave ship for seven months, but she hasn’t lost hope, she is waiting to be chosen. She has been waiting until the moment when she will be taken from her 4×4 foot cage, but it isn’t Oort who chooses her, but a visiting captain, Border Relic. Lia had a plan, but after it was thwarted she must find a different way to get to General Oort to fulfill her goal of revenge. Border Relic is an intergalactic space peacekeeper and couldn’t just let Lia suffer when she clearly was not like the other slaves. Ultimately Relic gets caught up in her plans and her story and must choose to follow the rules or go with his gut. I normally don’t pick up science fiction as it strays so far from reality, but Firestar Released had many realistic grounding elements to keep my interest. Though not all characters are “human” the main characters are enough human for them to seem completely relatable. Though technology has advanced to intergalactic space travel (necessitating a peacekeeper) the everyday technology is still familiar (or at least not everything familiar has been upgraded). 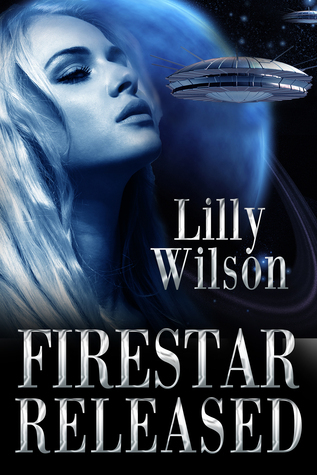 There were science advancements and unbelievable changes, but Wilson does well in controlling how much she has changed between life now and life in the Truestar Trilogy. The characters are relatable, even though their names may truly be science fantasy. I loved the names. Border Relic is the captain and I can totally imagine it being his name even while both parts indicate words known in English. Lia’s name is Ipoliamalandria, which can be pronounced if you think about it (and Border does say her name multiple times out loud). Lia is a great character. She has a high resilience and a fixation on her revenge. Her growing feelings for Border don’t interfere with her personal goals. She is a determined woman and even though she might not be the greatest role model, the fact that she is determined makes her a worthy hero. The story had romance, but the romantic element didn’t overpower the main story or personal character development. The only character I wanted to see/know more about was General Oort. His cruelty was only seen through the eyes of others and his personal story might be interesting to read. This novel was published by Amazon Digital Servies 11/03/2014 and is available on Amazon here.